The previous “building permit” issued by the Township Zoning Office has been replaced with a two-part permitting process. The “land use” and “construction” permits are described below. To view this in a PDF format, please click the “PDF” button above. All structures in Washington Township require a Land Use Permit (formerly known as a building permit). This includes all temporary structures and buildings not on a permanent foundation. In addition, all structures covered under the Pennsylvania Construction Code are required to obtain a Construction Code (building) Permit prior to starting projects. For all construction projects applicants should start at the Washington Township Municipal Offices to obtain a Land Use Permit Application. The Township has up to 30 days to issue this permit, but normally approves Land Use Permits in several working days. Applicants should allow at least a week for this process. When a Pennsylvania Construction Code Permit is required, the applicant is required to apply for this permit with the Township’s construction code agency, which is currently Commonwealth Code Inspection Service (CCIS). CCIS requires at least 15 working days for residential projects and 30 working days for commercial or industrial projects. If you are constructing a dwelling, is the land properly subdivided and on a separate deed as a separate lot. Only one dwelling unit is permitted per lot. Know the zoning district your property is in, and whether the construction planned is permitted in that district. Know the Township’s property line setback for structures in your district. Different districts have different setbacks and lot size requirements. If constructing a dwelling, know whether you are using public water and sewer or whether a permit for a well and septic system is needed. If public sewer is not available, the property must have a percolation test for septic systems on file with the Township, and a separate permit from the Township is required for any new well. Normally, the above information is available at the Township office, but may take some research to obtain, thus increasing the time needed to process the Land Use Permit application. 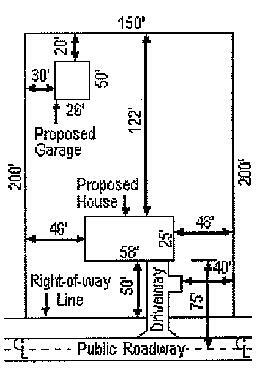 Show distances from property line for proposed structure. Distances to be in feet, and for distances over 100 feet, indicate 100’+. Show all existing buildings on lot, measurements for new structure only. Apply for a Building Permit from Commonwealth Code Inspection Service, if the proposed construction falls under the Pennsylvania Uniform Construction Code (Act 45 of 1999). Additional information regarding requirements for this permit may be obtained from CCIS at (717) 262-0081 or (717) 264-9191. Their office is located at 1102 Sheller Avenue, Chambersburg, PA 17201. If using public water and sewer, apply for those connections at the appropriate utility. Water is provided by the Washington Township Municipal Authority (717) 762-3108, and Waynesboro Municipal Authority (717) 762-2101, depending on the location of your construction. All public sewer is provided by the Washington Township Municipal Authority. If installing a new septic system, contact Jon Piper, (717) 328-5769, the Township Sewage Enforcement Officer. If installing a new well, obtain a well permit from the Township office. You will need to know the name of your well driller and the proposed location of the well. When doing any digging in the State of Pennsylvania, you are required to call “PA One Call”. This call will inform all utilities of where your digging is to take place. If a utility is located in the vicinity of the dig, the utility will mark where its lines or cables are located. This law prevents unnecessary damage or physical harm. The phone number to call for additional information is 1-800-242-1776. 1. Install the construction entrance? 2. Place silt fencing around the area to be disturbed? If you have any questions on the proper procedures to minimize soil erosion, call the Franklin County Soil Conservation District at (717) 264-8074, extension 5. One all your permits have been issued and if needed you have contacted PA One Call, you may start construction on your property. The first step is to construct a proper construction (driveway) entrance. All construction and other vehicles shall use only this entrance to enter the property. Drainage swales along the front or with the property shall not be disturbed during construction and shall be protected by placing silt fencing along the edges of the drainage swales. Any damage done to drainage swales shall be repaired by the applicant/contractor in a reasonable amount of time. Failure to repair the drainage swale will result in the Township repairing the swale and invoicing the owner of the property accordingly. All drainage and utility easements shall be maintained with extreme care. The public road shall be kept clean from any mud, debris, vehicles and equipment. The Township has the right to inspect any property at any time when a land use permit has been issued. Note that an easement gives the right to the Township or utility workers to do maintenance on their utilities in any manner at any time in order to maintain or repair their facilities as soon as possible. Be sure you are aware of any easements on your property. When you visit the Township office to apply for a permit, please have the required information with you. You need a site plan (Exhibit A) and sufficient information to complete the application. For dwellings or commercial buildings a floor plan is required. The property owner is required to be aware of all notes on the approved plot plan, and is responsible for making their contractor aware of these requirements. Please take notice of any special requirements involving setback requirements, storm water, driveway, and/or easements. In new subdivisions a Land Use Permit or Construction Permit may not be issued until the final plot plan is approved by the Township. A Land Use Permit or Construction Permit may not be issued for any property that is in violation of any Township Ordinance. If construction involves a dwelling unit, commercial or industrial building, or any other building which will be occupied by people, two occupancy permits will be needed, one from CCIS, and one from the Township. All swales must be properly graded and installed per approved plan and have grass established in them. Failure to obtain any required occupancy permit will result in legal action being taken to correct the situation. A driveway permit is required to access a State or Township road. For entrances on a Township road, the application for the driveway permit can be submitted at the same time as the application for a Land Use Permit. Normally only one driveway per lot is permitted, and the Township will check the proposed location for sight distance, impact on swales or storm-water, and compliance with approved lot plan. For a driveway permit on a State road, contact PennDOT at (717) 264-4171 for information and application forms. Public and private water and sewer connections are covered above. Electric power in the Township is through West Penn Power, phone service is Century Link, natural gas, where available, is UGI. All residents are required to have a contract with an approved Waste Hauler OR take their trash and recycled materials to the Washington Township Transfer Station. It is located at 12721 Buchanan Trail East, Waynesboro, PA. There is a fee at the transfer station for trash and garbage, but recycled materials accepted there are taken at no charge. Please see the blue tab on left “Transfer Station & Recycling” for more information on items that can be recycled or contact the Township Office at (717) 762-3128 or the Transfer Station (717) 762-4413. Recycling is mandatory in most of Pennsylvania, including Washington Township. Current waste haulers are listed in the Yellow Pages and all companies listed there are approved to haul trash in Washington Township.